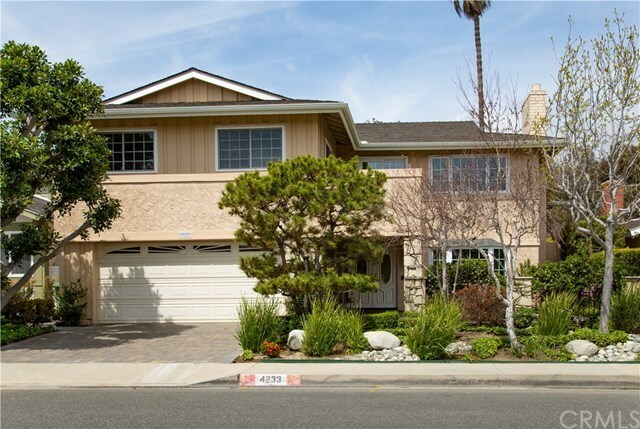 Spectacular Remodeled Seal Beach "Oasis" in the Perfect Location! Over $300,000 of Improvements! Beautiful Curb Appeal with Custom Landscape, Stone Paver Driveway, Bay French Window, and Front Porch to Greet the Neighbors for a Weekend or Post Work Cooler! Inviting Stained Glass Double Door Entry with Freshly Finished Dark Hardwood Flooring and Staircase! Formal Living Room with Marble Fireplace and Hearth! Formal Dining Room with French Doors and "Oasis" View! Great Room style Family, Dining and Kitchen Area with Distinctive Rock Fireplace and Breath-Taking View! Beautifully Remodeled Gourmet Kitchen with Antique Glazed Cabinets, Stainless Appliances, Built-In Paneled Refrigerator, Built-In Wine Cooler, Custom Granite Counters and Island, and Pass Thru Bar to Backyard! Remodeled 1st Floor Bathroom with Spacious Shower (most have 1/2 Ba). 1st Floor Bedroom Currently Built-out as Office or Den! Elegant Remodeled Master Suite with Marble Fireplace, and Balcony! Luxurious Master Bath with Sensational Appointments! Huge Bonus Room with Wet-bar and Built-ins! No Need for an Expensive Tropical Vacation with this Private Backyard Oasis! Awesome Rock Sculptured Pool, Spa and Decking! Fantasy Waterfall over Private Love Seat! Spacious Spa with Extra Bubbles! Swim-up Bar with Underwater Stools! Spacious "Baja Shelf" to Stay Cool with a Book! Warm Up with your Stack-Rock Fireplace! No Homes Behind to Spoil Your Privacy, Only Lampson and Old Ranch Golf Course! Directions: From Lampson, Turn on Candleberry, Turn immediately left onto Ironwood.